MODULAR HOME BUILDER: Get Your SWOT On! Get a lay of the land by doing some honest soul searching about your company and its competitiveness. 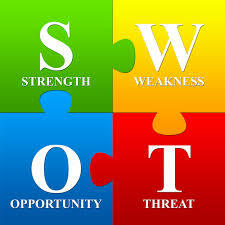 The SWOT analysis has been around for years but is helpful getting a feel for your company’s Strengths, Weaknesses, Opportunities and Threats. This assessment will not only assist in developing a marketing plan and strategy but will also increase your understanding the business landscape and advantages. What does your company do well? Is there a capacity to build upon those strengths and expand on them? How strong are your processes, services, staff competencies? Is there an opportunity to capitalize and gain a competitive advantage? Where do you fall short or need help? Be brutally honest with yourself and with all the people that surround your business. By doing an honest assessment of your company you can then recognize what is really needed to improve your company? Where are you at a competitive disadvantage? What are the opportunities in your core business that you may be missing? What other services could be introduced to enhance your business that could be perceived as an added value. Make sure that the add-on is a natural fit and isn’t coming out of left field. Where are you strong and where are your competitors weak? Often times we take for granted things that we do and don’t recognize them as actual benefits that need to be communicated. We neglect to communicate processes that may be redundant in the industry but new to your customer. When you communicate those processes as benefits, even when redundant you take ownership of them and are making them your own. This is especially effective and true when your competition does not think about mentioning them. Brainstorm opportunities with your staff and see what you come up with. Threats can sometimes be anticipated and at other sometimes come out of thin air. This is where you have to be a prognosticator and chief and access current market conditions that can affect your business. Sometimes the treats can be local, regional, national or even global economic in nature. A local factory could go out of business or the stock market could drop. Demographic changes could happen in your market that could affect what sort of product you market. Most treats that do occur are those that we can prepare for and are often somewhat within our control. Sometimes we fail to keep up with the rapid pace of change. Are you current with the latest building techniques and materials, designs that your market may be demanding, new Inbound Marketing practices etc? The product that you built 15 years ago and they way that you marketed is probably not going to fly today. You know what they say the only constant is change. Anticipate what you can and prepare for the future.